Lamar University's bachelor's degree in communication with an emphasis in broadcasting offers you valuable hands-on experience fresh out of high school, an opportunity most students would love to have elsewhere! Our program is designed to give you a strong foundation and even stronger experience. You'll take courses in digital editing, audio production, TV writing and performing and television field production, among others. We strongly encourage participation in Lamar University Television (LUTV) and KVLU Public Radio. 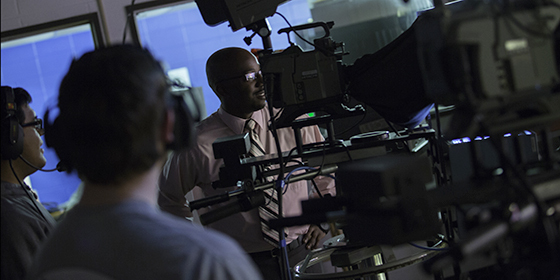 Our graduates have worked at CBS, ESPN, CNN , BET, and Disney, and often work in key positions. LUTV on Fox production featuring an interview with outgoing Lamar president James M. "Jimmy" Simmons. Evan West conducts an in-depth interview with Bill Macatee, Lamar alumnus and CBS sports anchor. Download the broadcasting track degree plan.